Stella & Chewy's products combine free-range meats, with no hormones or antibiotics, and the freshest farm-grown ingredients, organic where possible. Our food is uniquely formulated to strengthen your pet's immune system and add healthy years to your pet's life. Stella & Chewy's is also free from grains, which means it can help with weight loss, is excellent for dogs with allergies, and helps reduce plaque and tartar buildup on canine teeth. Lamb, lamb spleen, lamb liver, ground lamb bone, lamb heart, lamb kidney, pumpkin seed, organic cranberries, organic spinach, organic broccoli, organic beets, organic carrots, organic squash, organic apples, organic blueberries, calcium carbonate, potassium chloride, direct-fed microorganisms (Pediococcus acidilactici, Lactobacillus acidophilus, Bifidobacterium longum, Enterococcus faecium), magnesium oxide, natural tocopherols, vitamin E supplement, biotin, potassium iodide, vitamin D3 supplement. Serve as is or rehydrate by adding warm water. Your pet should consume 1/4 cup of water per patty daily. New Users: Mix Stella & Chewy’s with your current brand for the first 5-7 days. Click here for transitioning guidelines. 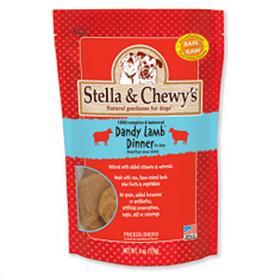 Our chocolate lab Sam loves his Stella and Chewy Lamb Dinner for Dogs! Actually, he loves them all! The Surf and Turf, the Chicken, the Beef.... We get them all and alternate them! He always licks the bowl!!! Instead of cooking for my picky dog, I now give him these patties which has made my life so much easier. He loves the lamb and duck flavors! I only crumble one or two over his dry since they're a bit pricey. However, the convenience and health factor are well worth the cost to me. My pup can't get enough of this stuff! I break up the patties and give her pieces as a training treat. I was a bit concerned about how her sensitive stomach would react to this product. She also is a bit picky. No problems!!! I would have never thought to try this product, but the staff at Natural K9 Supp highly recommended it. Pup tried it and she has been in love with it ever since! Elsie, the 3 pound chihuahua, gobbles this food when offered. I like the convenience of the dehydrated due to travelling and the occasional time that she has to go stay with friends when I'm out of town. My dog is on a raw diet, so when we go on trips we can't feed him raw we feed him the dandy lamb dinner!, he loves it!